No members of the Royal family will be invited to attend events marking the centenary of the 1916 Easter Rising. Irish-based ambassadors will be the highest level of foreign dignitaries present, according to a report in the Irish Independent newspaper. The Irish government had initially indicated that a member of the Royal family could play a role. However "high level representatives of Ireland's international partners will not be in attendance". Following the visit of Irish president Michael D Higgins to the UK in 2014 and the Queen's visit to Ireland in 2011, British Ambassador to Ireland Dominc Chilcott told Radio Ulster's Talkback programme that the visits could help pave the way for Royal participation. He said at the time: "If the relationship between Britain and Ireland is as good as can possibly be, that will be easier to do. "The fact is we have a very good very strong relationship now." Under the Freedom of Information Act (FOI), the Irish Independent obtained copies of email exchanges on the subject between Mr Chilcott and the Irish government. In March, an official in the Anglo-Irish division of the Republic of Ireland's Department of Foreign Affairs wrote to Mr Chilcott providing him with the Irish government's "public line in response to any question about inviting high-level visitors to the core Easter 2016 events". The statement says: "The events in the Ireland 2016 state ceremonial programme will be moments for national commemoration. "Therefore high-level representatives of Ireland's international partners will not be in attendance at these Easter events (although as is normal for many state ceremonial events, members of the diplomatic corps accredited to Ireland may be invited to particular events." In a statement, the British Foreign and Commonwealth Office (FCO) said: "Her Majesty's government is committed to working closely with the Irish government during the decade of centenaries marking the events of 1912 - 1922 to promote a greater understanding of our shared history, and to do so in a spirit of historical accuracy, mutual respect, inclusiveness and reconciliation. "Our hosts have suggested that this is something that is appropriate for the diplomatic corps. We wish to be represented at appropriate level and that is a standard part of diplomacy," a spokesman added. The Easter Rising was a Republican rebellion which lasted from Monday 24 April (Easter Monday) to 30 April 1916. The aim was to end British rule in Ireland and to establish an independent Ireland as a republic. 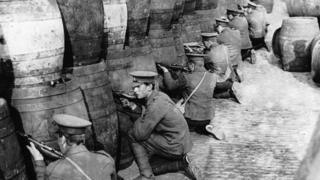 Despite its military failure, the Easter Rising is seen by many as being a significant stepping-stone in the eventual creation of the Irish Republic. It was the most significant uprising in Ireland since the rebellion of 1798.